What is it like to go to school for the first time in contemporary Britain? Yesterday, the first episode of a CBeebies programme, Time for School, attempted to prepare young children for their experience of what the Guardian TV guide called “noise, glitter glue, playground barbarism and incessant phonics”. For most of the programme, the camera stayed close to the ground to show the child’s perspective: the show was “a great way to ease tinies into their impending future,” according to the Guardian. My reaction was that, if I were one of the young audience, any forebodings I might have had about the tedium and social control of the classroom would have been reinforced. I’ve now watched the first three episodes of Time for School, and so far the children have been spared instruction in reading. 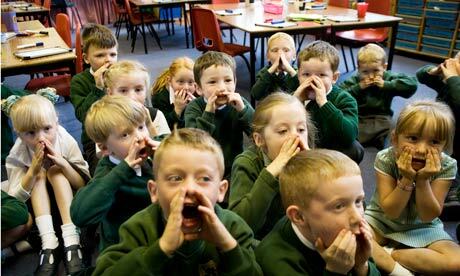 So why did the Guardian writer use the phrase “incessant phonics”? It sounds as if they may have been extending their own child’s experience into that represented by the programme. Certainly, recent years have seen incessant government promotion of “synthetic phonics” as the key to success in training young readers. In April 2011, primary schools in the UK were offered government funding to match their own spending (up to £3000) on “materials which meet the Department of Education’s criteria for an effective phonics programme”, and, in September of the same year, the government announced that a new, statutory “phonics screening check” for all children in Year 1 would be introduced immediately, “to confirm that all children have learned phonic decoding to an age-appropriate standard”. The overall aim is that children should learn phonics “first and fast”, and gain the ability to read even words they don’t recognise by decoding grapheme/phoneme correspondences. It would be interesting to know what such a programme of instruction feels like to youngsters – especially, perhaps, to those who start school with some acquired ability to read: an ability that is likely to be multi-faceted, involving contextual clues (such as pictures) as well as emerging grammatical understanding (such as recognising prefixes and suffixes). I have recently been involved in running a survey of teachers’ experience of helping early readers. About one in twelve of the survey respondents agrees with the assertion of the Department for Education that the ability to decode grapheme/phoneme correspondences is the first requirement for success in reading. But the view of more than two-thirds of respondents is that, while phonic decoding is an important part of learning to read, other strategies are also vital. More than a quarter of respondents emphasise the importance of reading for meaning, and there is much concern that an overemphasis on phonics leads to an unbalanced reading curriculum in which other reading skills such as prediction and contextual information are not taken into account. In the view of many, a phonics approach leads to less able children “barking at print” while good readers lose motivation and fail to achieve appropriate assessment results. Some children, it is alleged, develop a style of “reading” that consists merely of phonic decoding. There is less time for reading stories and for listening to young readers, and more time is taken up by “teaching to the test”. In such classrooms, respondents argue, the overall quality of pupils’ literacy experience declines. It sounds as if the Guardian feature writer might agree.